Halloween is just around the corner…can you believe it? 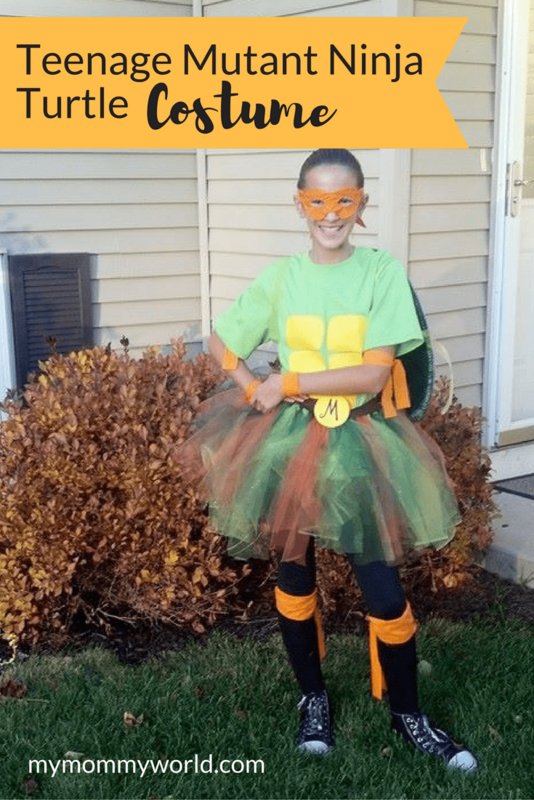 It’s not too late to make your kids’ costumes for this year, and I’ve got an adorable Teenage Mutant Ninja Turtles Costume for you that is easy to make and won’t break the budget either. This costume is the creation of my cousin, Holly Kappes. 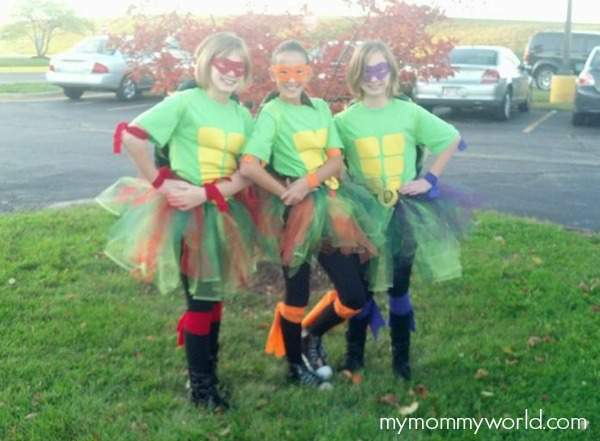 I saw her pictures on Facebook the other day and just fell in love with the costumes she made for her daughter and her friends. When I asked her if I could feature the costume on my blog, she was gracious enough to share it with us! Each costume was less than $30 because of a 25% off entire purchase coupon at Joanne’s and good deals all around. 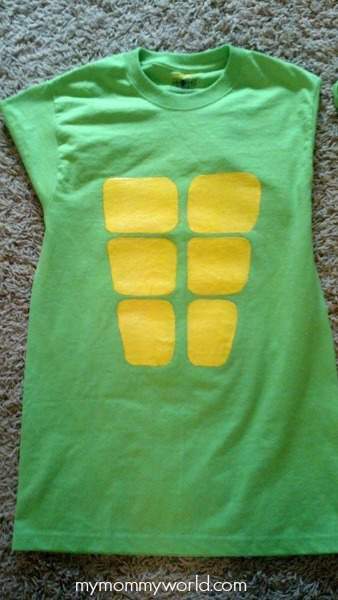 Shirt: I made a template of the abs. I just used a cardboard folder and stenciled abs on and cut out a stencil. I laid it on the shirts right at chest level and penciled it on. That way the girls just needed to paint in the lines. Use yellow craft paint to paint on abs…Easy peasy! Skirts: They are super easy. Cut a long enough piece of ribbon that will tie around the waist with left over to tie in a bow and hang down a little. I cut the tulle in 5-inch sections right off of the bolt. (Tulle comes folded in half on bolt.) Cut into 5in sections and then cut in half at the fold so one cut gives you 2 pieces. For each skirt, depending on size of girls, you will want between 50 and 60 pieces of tulle to make them nice and full. Lay ribbon out flat in a straight line on floor. Sit on the floor and put each heel on ribbon to hold it flat and tight. Take 1 piece of tulle and fold in half place under the ribbon and do a slip knot (pull ends thru the folded side of tulle. Super easy. We did lime green and then dark green repeating. We did all the green first and then went back and added the color of the turtles. 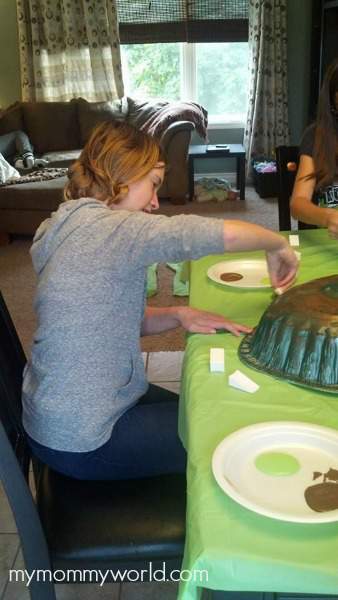 Shell: Spray paint the shell dark green inside and out; it takes 10 minutes to dry. 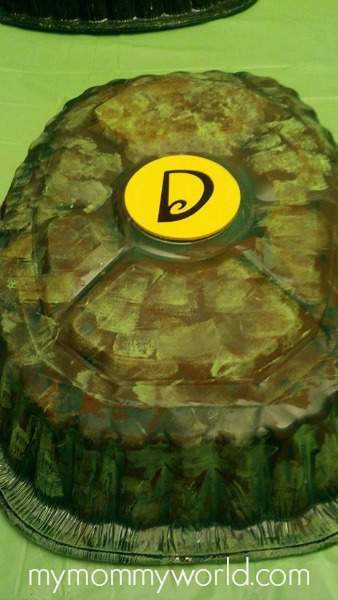 Put a small amount of lime green and brown paint on a plate, then take face sponges and use them to dab the paint in a camo design on the shell. Then hold shell up to their back Take knife and cut small slits where you can attach ribbon so they can wear it like a back pack. You’ll need a slit on top of shoulder and by armpit on each side. Tie ribbon so they can wear shell. Belt: Cut strip of brown fleece fabric about 1-inch thick. Paint wooden discs yellow and add letter. Hot glue the disks to belt and to back of shell. Ties: Cut 1-inch strips for elbows and wrists in each color. Cut 3-4 in strips to tie at the knees. I hope you love this costume as much as we do! What a great costume idea!